Open Trip Planner lets you plan trips mixing transit, walking and biking into a single itinerary. You can customize all trips by moving a circle inside a triangle, adjusting for time, hills and safety. You even get elevation profiles from the USGS, which should help people determine which parts of the route might be harder to bike and walk. TriMet, the regional governing body, operates the light rail system, the WES (Westside Express Service) commuter train, and the bus routes. TriMet’s drivers and mechanics (and their families) pay no medical premiums, no deductibles and $5 doctor co-pays. The benefits follow them into retirement. Medical coverage for spouses and dependents continue for 16 years after a retiree’s death. In 2007 Amalgamated Transit Union 757 successfully lobbied legislators to gain the right to binding arbitration, which critics say hands labor disputes and, ultimately, control of tax dollars to a third-party arbitrator. It’s at the heart of a 30-month labor impasse between TriMet and Amalgamated Transit Union 757. The union has rejected a proposed benefits rollback even as Oregon’s largest transit agency continues to raise fares, cut routes and cram more commuters on buses and trains. As the two sides prepare to go to “winner-take-all” arbitration in May 2012, TriMet is scrambling to fill a $12 million budget hole. Without a change, employee health costs will probably consume more than 50 percent of TriMet’s annual payroll-tax revenue for basic operations by 2020, essentially transforming the transit agency into a health care provider. As of 2012 health care cost are just under $20,000 for a TriMet employee according to Regence Blue Cross Blue Shield (TriMet’s preferred provider). Two units cross the Interstate 405 freeway on Morrison Street. One heading east and the other west. Washington Park MAX station is the deepest in North America at 260 ft below ground. This is MAX’s only below ground station. The Portland History website has interesting photos and stories about Oregon trains. Streetcar rider ship has exceeded forecasts. NextBus uses Global Positioning System (GPS) tracking satellites to provide bus and train arrival information and real-time maps for passengers. The goal of TriMet’s public art program is to promote increased transit usage and community pride by integrating temporary and permanent art works into TriMet’s public transit system, thereby celebrating the contributions of public transportation and recognizing the cultural richness in the region. An artist rendering of the new MAX trains for the Green Line. TriMet has ordered 21 new MAX trains from Siemens Transportation Systems for the I-205/Portland Mall MAX Light Rail Project scheduled to begin in 2009. Keep Portland Moving began as a multi-agency effort to coordinate large public projects to reduce traffic impacts. Today it includes a Portland Office of Transportation campaign to help promote a vibrant, accessible downtown Portland, both short term and in the long run, by minimizing the combined construction impacts of the Portland Mall project and private development in the downtown core in 2007 and 2008. The Portland-Milwaukie Light Rail Bridge serves light rail trains, pedestrians, cyclists, and in the future, Portland Streetcar. The bridge does not serve private vehicles, but will be able to accommodate emergency vehicles. The Portland-Milwaukie Light Rail opened in September 2015. TransitTracker™ provides real-time bus and MAX arrivals online over the phone. The system tracks the actual location of your bus or train, so you know exactly when your ride is coming. Each stop has an unique “stop number” displayed on a sign like the photo above. Get arrival times over the phone: Just dial 503-238-RIDE (7433) from any touch-tone phone. If you’re using a web-enabled cell phone, you can access TransitTracker at trimet.org. Also at web-enabled PDA, log on to pda.trimet.org. If Portland is mentioned in any out-of-state media, rest assured the news item is either about Portland’s effort to contain urban sprawl or its public transportation system. 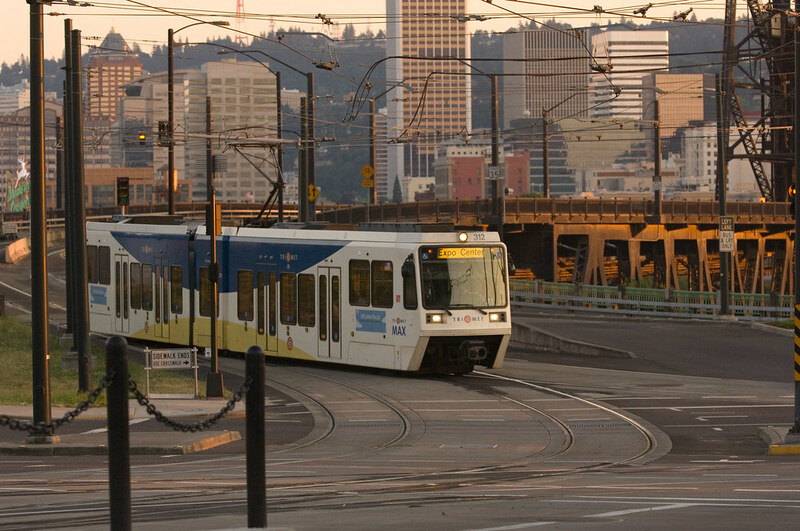 Three public transportation modes are used by Portlanders: light rail, buses, and streetcars. The City of Portland Office of Transportation is a community partner in shaping a livable city. Their website is packed with information about getting around Portland. TriMet, the regional governing body, operates the light rail system, the WES (Westside Express Service) commuter train, and the bus routes.The Portland Streetcar is owned by the City of Portland and a private non-profit runs the streetcar system. Below are three maps to help you navigate the public transportation system. System Map Light rail, WES commuter train, streetcar, bus, and tram. Rail System Map Light rail, Westside commuter, and streetcar. City Center and Free Rail Map Shows the light rail, streetcar, and bus lines in the downtown area. Dadnab Dadnab uses as old-fashioned text message − just text your location and destination to 503-406-8622 to give it a try. And you don’t need to shell out $$ and a long term contract to get it. Portland Transit Trip planner for Android. It allows you to look up arrival times for any stop that TriMet reports. This includes all MAX stops, bus stops, and WES stops (unfortunately Streetcar times are not currently available). Pdxtrian Location and arrival app and its a free Android app. ArrivalTracker for the iPhone is its equal showing TriMet bus and train arrival predictions. Transitly Unlike mapping and trip planning applications, Transitly for the iPhone does not offer maps, step by step instructions, or routing information. The logic is that most ride the same one or two buses or trains everyday, and don’t need all these features. All they need to know is: “When is my next bus?” Transitly for the Android provides you with personal mass transit timetables on your Android device. line was later named the Blue Line when TriMet went to a color-coding system in 2001. When it was built, MAX was only the third modern light-rail system in the country. Since then, light-rail has sprung up in over 20 cities in the nation.How did light rail come to happen in Portland? It goes back to the fight over the Mt. Hood Freeway, which would have branched off Interstate 5 at the Marquam Bridge and run east toward Gresham. The plan was to push it through Southeast Portland, along a route that would have required bulldozing many of the neighborhoods between Division Street and Powell Boulevard. Among other things, that freeway would have paved over the areas such as Seven Corners, the Clinton Business District and hundreds of old homes in the area. In 1974, after the neighborhood revolved, the freeway plan was scrapped and federal freeway funds were aimed instead toward light rail and other transportation improvements.The light rail system is now about 60 miles since the Milwaukie-to-Portland line added 7.3 miles of track to the system in 2015. Eastside MAX Blue Line The first phase, Eastside MAX (Metropolitan Area Express), connected Gresham, Oregon state’s fourth largest city, with downtown Portland, and was constructed between 1982-86. Between 1990-97 TriMet ridership grew 40 per cent faster than its population growth. During the same period, TriMet ridership grew 30 per cent. Westside MAX Blue Line The Westside MAX, Hillsboro to Portland light rail system began service in September 1998. Construction began on the 18-mile light rail line in May 1994. The Westside line has 20 stations, nine park and ride interchanges and has spawned numerous other developments. The 33-mile run from Gresham to Hillsboro takes 93 minutes. Airport MAX Red Line This was a $125 million, 5.5-mile extension developed through an innovative public/private venture involving the Port of Portland, TriMet, the City of Portland, Portland Development Commission and Bechtel Enterprises. Bechtel contributed $28.2 million towards the $125 million project. It links Portland International Airport to the existing regional light rail system. The system was completed in late 2001. Interstate MAX Yellow Line A 5.8-mile segment opened May 1, 2004. This $380 million line connects MAX to the Expo Center along North Interstate Avenue. It is a unique opportunity to revitalize businesses and neighborhoods along North Interstate Avenue, once Portland’s main gateway. South Corridor Green Line The $575.7 million (6.5 miles) expansion of light rail to Clackamas Town Center along Interstate 205 and on to the downtown transit mall to Portland State University opened in September 2009. The Federal government picked up 60 percent of the project or about $345 million. The Green Line connects 19 bus lines, five park-and-ride lots (2,300 spaces) and one of the largest regional malls, The Clackamas Town Center. It also connect to the Red Line for access to the airport. The project transformed Portland’s old and aging transit mall into an inviting place for residents, commuters and shoppers. The Green Line runs the length of the Mall, connecting Union Station and Portland State University. A number of improvements, including refurbished streets and sidewalks, new transit shelters, better lighting and eye-catching public art, were part of the project. Regional leaders see the new Orange line to Milwaukie as the fulfillment of a 20-year promise to connect the southeast metro area to downtown with mass transit. Metro expects daily rider numbers for the route to top 14,000 per day, as 50,000 residents live within walking distance of the light-rail line. The Portland-Milwaukie light-rail runs between Southwest Fourth and Southwest Fifth Avenues near Portland State University, crosses the Willamette River on the new transit bridge near Oregon Health and Science University, and follows the Tillamook Railroad into Milwaukie.The 7.3 mile light-rail line serves 11 stops, nine of within Portland’s city limits. It opened on September 12, 2015. A bridge (see below image) for $1.4 billion light-rail line to Milwaukie, carries everything but cars and trucks. The bridge will carry MAX trains, buses, streetcars, cyclists and pedestrians. For seniors and riders using mobility devices, the layout allows for four additional seats between the doors. The layout of the Type 5 trains is similar to that of the MAX Type 2 and Type 3 vehicles. In the “parlor cab” (the area at the coupled end of each MAX vehicle) most seats now face the doors. They also added more legroom to the seats near the center door windscreens. In the center section of the train, TriMet removed two notoriously uncomfortable seats and all seats face the aisle, as they do on many of our older trains. The Portland-Milwaukie Light Rail opened on September 12, 2015. Construction on the project’s light-rail bridge begin in mid 2011. This early construction work allowed crews to take advantage of the relatively small “fish window,” where in-water work can be done with limited impact to migrating fish. There are two Park & Ride facilities, along with two Bike & Rides, on the Orange Line. You can park free up to 24 hours at both new Park & Ride locations. (You can park overnight, too, as long as you observe the 24-hour limit). The SE Tacoma St/Johnson Creek Station is located near the Sellwood, Westmoreland, Ardenwald-Johnson Creek and Eastmoreland neighborhoods in SE Portland. The station is connected to the Springwater Corridor Trail, which runs from the Willamette River, through Gresham and out to Boring. SE Tacoma Street/Johnson Creek Station 318 cars and 72 bikes. There are also electric vehicle chargers with universal port connections. SE Park Avenue Station 401 cars and 74 bikes. The SE Park Avenue Station, in Clackamas County’s Oak Grove neighborhood, is the Orange Line’s southern terminal. The station’s Park & Ride has 401 parking spaces, plus seven electric vehicle charging stations. Bike commuters can use the station’s Bike & Ride, which holds 74 bicycles, with an additional 28 bike rack spaces available at the station. A signature feature of this Park & Ride is the building’s rooftop solar array. It provides enough energy to offset annual electricity usage for the building’s basic functions like elevator and light usage — making it a net zero facility. Learn more about the MAX Orange Line, station by station. One of the vital element of the Portland-Milwaukie Light Rail Transit Project is a new bridge across the Willamette River. Named Tilikum Crossing, Bridge of the People, this bridge is distinctive in the United States, designed to carry light rail trains, buses, cyclists, pedestrians and streetcars, but not private vehicles. However, emergency responders will be able to drive on it if necessary. Photo of the bridge by Larry Hales. The bridge has a cable-stayed design, with two piers in the water. A cable-stayed bridge is a bridge that consists of one or more towers through which cables are strung to support the bridge deck. Cable-stayed bridge types are efficient at spanning long distances while allowing a reduction of the number of piers in the water. Such bridges also can be designed with thinner decks than other bridge types, making possible a more transparent structure and a greater vertical navigation clearance. The bridge lighting is an artistic blend of art and science using U.S. Geological Survey water-quality and streamflow data collected from the Willamette River at the Morrison Street Bridge. Data from the Willamette River are translated by specialized software and displayed along the cables and pillars of the new bridge using LED lights. There are 178 LED lights aesthetically placed on 40 bridge cables, the four transmission towers above and below the deck, and on the Sonic Dish artwork along the Eastside Esplanade and future Willamette Greenway at the ends of the bridge. The lights change colors based on the Willamette River’s speed, height and water temperature. Specialized software designed by programmer Morgan Barnard takes that data and translates it into movements of color and light across the bridge. The water temperature determines the base color. The river’s speed controls the pace the colors change and move across the bridge. The river’s height is displayed by a second color that moves vertically up and down the towers and the cables. The water-quality monitor at the Morrison Street Bridge “Super Site” is an advanced data-collection platform that measures standard and state-of-the-art water data. The site measures water speed, direction, depth, temperature, dissolved oxygen, pH and conductivity, as well as turbidity, phycocyanin, chlorophyll, nitrate and fluorescent dissolved organic matter. Together, these data streams give a comprehensive, real-time picture of hydrologic conditions in the Willamette River. View a YouTube video by Mark Warner of the light show. On May 9, 2016 officials planning a new high capacity transit line from Portland to Tualatin approved MAX light rail as the preferred transit mode to come to the area, and said that they will not continue studying a tunnel under Mount Sylvania to Portland Community College. The Southwest Corridor Plan has been working to bring some sort of high capacity transit line to the Southwest suburbs for years, but officials had not made a decision about which kind of transit line would be built until this week. The project’s steering committee — made up of elected officials from across the corridor, as well as officials with TriMet and ODOT — approved MAX light rail as the preferred mode. Project officials had also considered a bus rapid transit system, or BRT. The buses would be similar to Eugene’s EmX line, which uses a combination of public roads and private thoroughfares. TriMet is planning a BRT line from Portland to Gresham. Streetcars are back in Portland! They left in the 50s and started again on July 20, 2001.In the days before automobiles and smooth roads, streetcars were the primary way around most American cities. Portland’s first public-transit system, a horse-drawn trolley along the old First Street, opened in 1872. In 1906, the Portland Railway Light and Power company operated 40 lines over 172 miles of track. At one time Portland had the third largest streetcar system of its kind in the United States. Its cable car line was steeper than anything in San Francisco. Most of the streetcar companies were privately-run operations that were also involved in real estate and electrical power. Some even built amusement parks, known as “Trolley Parks,” to attract riders on weekends and off hours. RiverPlace Extension The Portland Streetcar extended the line .6 tenths of a mile to RiverPlace (south of downtown along the river). Construction of this extension started in the Winter of 2003 and opened March 12, 2005. Gibbs Extension to South Waterfront This extension was completed to SW Gibbs in late 2006. This 0.6 mile extension connects at SW River Parkway and SW Moody, follows SW Moody south to SW Sheridan and from SW Sheridan to SW Gibbs utilizing the former Willamette Shore trolley rail right-of-way. The stop is located at SW Moody and Gibbs at the base of the Portland Aerial Tram. The cost of this extension was $15.8 million, which includes purchase of three additional streetcars. Extending the line to SW Gibbs was a high priority for the newly emerging South Waterfront “River Blocks” development and the Oregon Health and Science University’s Building One, a 16-story building, that contains outpatient practices, educational offices, and research laboratories. Lowell Extension to South Waterfront The Portland Streetcar started construction on the Lowell Extension in August of 2006 and it was completed in the summer of 2007. This 0.6 mile extension connects at SW Moody and Gibbs (base of Portland Aerial Tram), follows SW Moody south to SW Lowell, east on SW Lowell to SW Bond. The route continues north on SW Bond to SW Moody & Gibbs. Eastside/Lloyd Center/OMSI Extension The $148.27 million extension to the eastside, which broke ground in August 2009, will extend the existing Portland Streetcar System from the Pearl District across the Broadway Bridge into the Lloyd Center neighborhood and then south to the Oregon Museum of Science and Industry. The loop is set to open to the public in late 2012. The expansion means jobs − not only for construction to expand the streetcar system by three plus miles and 18 stations, but also for manufacturing the streetcars, which will be built by United Streetcar, a subsidiary of Oregon Iron Works, in Clackamas, Oregon. Eventually the line will “close the loop” and connect the east side of the river to the existing system on the west side of the river by using the same transit bridge that the light rail line to Milwaukie uses. It will connect the Lloyd Center to downtown. View a map of the proposed line. For construction updates on the line, click here. The cities of Portland and Lake Oswego, Clackamas and Multnomah counties, the Oregon Department of Transportation and TriMet have conducted a corridor study to evaluate possible transit and transportation options between Lake Oswego and Portland. Citizens, business representatives and property owners were selected to serve on a Project Advisory Committee that met to consider issues and alternatives.A streetcar connecting Portland and Lake Oswego could cost $379.6 million to $458.3 million to construct and another $1.25 million annually in today’s dollars to operate, according to a draft environmental impact statement recently released by Metro in early December, 2010. An alternate option, enhanced bus service, would cost roughly $51.1 million, plus $2.79 million annually to operate. TriMet showed off its new commuter train on January 21, 2009 at a “first ride” for Westside community leaders, the first public passengers on its route between Beaverton and Wilsonville. The Westside Express Service (WES) started as a proposal to ease congestion along the Interstate 5 corridor. After 14 years of planning and troubles with its manufacturers, trains will run about every 30 minutes Monday through Friday during morning and evening rush hours. Transit officials estimate that WES will have 2,400 riders a day. They expect it to reach 4,600 by 2020. Three self-propelled cars and one trailer complete 32 round trips a day. Each car has about 80 seats, along with standing room and space for bicycles and wheelchairs. In addition, WES will have free Wi-Fi onboard and interactive public art at each of its five stops. Parking for cars and bicycles will be available at most of the stops. Residents along the 14.7-mile rail line from Wilsonville to Beaverton now have the option to avoid the congested I-5 and Highway 217 corridors. You are able to ride commuter trains from Wilsonville, Tualatin, Tigard and Washington Square to the Beaverton Transit Center, where you can transfer to the MAX light-rail for the remainder of your trip to the Portland City Center. The first phase of construction—track rehabilitation—began in Wilsonville in late October 2006 and moved north to finish in Beaverton in January 2009. In early March 2007, ground was broken on the first of five commuter rail stations to be built for the Washington County Commuter Rail line. Formerly part of the Oregon Electric Railway, this line is now being operated for freight service by a short-line railroad, the Portland & Western. Unlike the MAX light-rail — which also follows freight rail lines for part of its route, but has separate tracks — the commuter rail service to Wilsonville operates on the very same tracks used for freight service. The WES line operates by diesel-powered equipment. Unlike other transit agencies, which use diesel engines to pull non-powered commuter coaches, TriMet purchased self-propelled Diesel Multiple Unit (DMU) equipment for this new line. This means that one unit, or vehicle, is able to drive by itself without being pushed/pulled by a locomotive. A typical DMU has several small diesel engines with automatic transmissions. Each bi-directional vehicle has a driver cab on each end, which allows a fast change of direction without driving through a long loop to turn the vehicle around. The driver simply walks from one end to the other. Several DMUs can easily and quickly be coupled together to make a longer train if a higher passenger capacity is needed, for example during the morning or afternoon peak hours or during special events. No additional train operator or other personnel is needed. 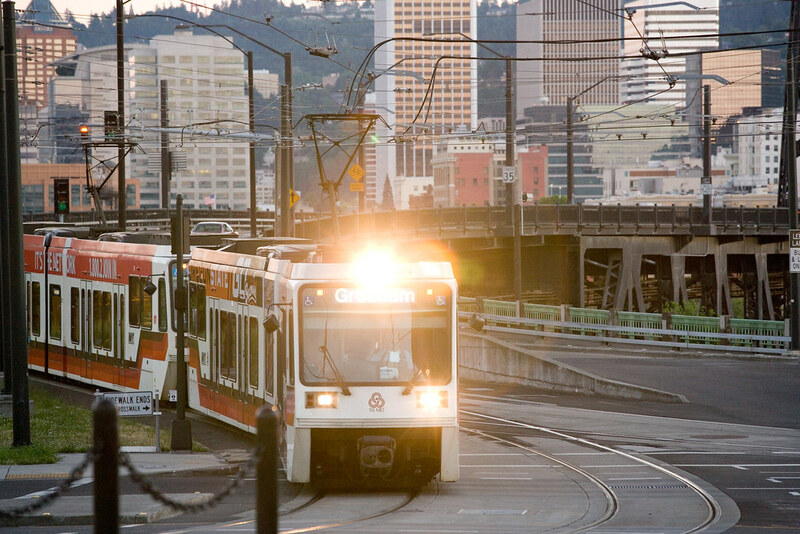 Free Rail Zone provided free rail rides (light rail and streetcars) in the downtown Portland area bounded by the Willamette River, Northwest Irving, and the I-405 freeway. In 2001, the fareless zone was extended across the river to the Lloyd District — Multnomah Boulevard on the north, Holladay Street on the south and 14th Street on the east. The fareless policy started in 1975 as a way to cut pollution and endured as a symbol of the region’s commitment to bus and light-rail use. Free bus rides were included in the early free zone but in January, 2010, the TriMet transit agency required that thousands of bus riders pay their full fare in downtown Portland’s Free Rail Zone. MAX light-rail lines and the Portland Streetcar remained free within the fareless zone.The free zone was called “Fareless Square” when it started in 1975. The name was changed to “Free Rail Zone” in January, 2010. TriMet dropped the free rides in September 2012 to make riding simpler by switching to ‘go anywhere’ fares. Now, all riders have to do is buy one ticket to travel anywhere they like. The switch is expected to help TriMet with their $12 million budget shortfall. They saved nearly $9 million by eliminating zones and increasing many of the fares. A portion of a $9.3 billion provision in the federal stimulus bill (March 2009) could beef up passenger train service between Eugene, Oregon and Vancouver, B.C. The bill includes $1.3 billion for Amtrak for capital projects and $8 billion for states to foster high-speed passenger rail. The federal money doesn’t begin to cover the cost to modernize the U.S. rail system enough to carry true “bullet” trains that travel at 200 miles per hour and up. Ten regions, including the 400-mile stretch of track between Eugene and Vancouver, B.C., were identified for high-speed rail more than a decade ago. It’s too soon to know if the Northwest corridor will receive stimulus money for rail improvements. In Oregon, the Department of Transportation is preparing its pitch to the Federal Railroad Administration.In Oregon, as in Washington, passenger trains run on privately owned track — Union Pacific in Oregon and Burlington Northern Santa Fe in Washington. High-speed rail does not benefit freight trains, which are limited by size and weight to 79 miles per hour. Passenger trains also travel top out at 79 miles per hour.If Oregon and Washington succeed in winning federal dollars, the plan eventually is to boost Amtrak speeds to 110 miles per hour. That’s well below the 200-mph “bullet” speed that are used across Europe and Japan. Trains also can’t travel more than 110 miles per hour without significant track improvements. Trains travelling faster than that must be kept separate from trucks and cars. That means streets and highways need to go over or under tracks, not across. It costs $4 million to $30 million to separate a crossing. With about 700 crossings between Portland and Eugene, the cost in Oregon would be $2.8 billion at a minimum. ‘Current investment in passenger rail in the Pacific Northwest Corridor will not be used to create a dedicated high speed passenger rail corridor from the ground up, but will instead create more modest systematic improvements to the existing railway used by the Amtrak Cascades line that uses trackage owned primarily by private freight railways. On January 27, 2010 the federal government announced $590 million of ARRA stimulus funds will go to Washington State for high speed improvements of its section of the corridor. Additionally, the state of Oregon will receive $8 million to improve Portland’s Union Station and trackways in the area. On December 9, 2010 US Transportation Secretary Ray LaHood announced that Washington State will receive an additional $161 million in federal high-speed rail funding from the Federal Rail Administration after newly elected governors in both Wisconsin and Ohio turned down their states’ high-speed rail funding. This brings Washington’s total funding to about $782 million. The Northwest isn’t expected to get high-speed commuter rail service in the near future (our existing freight tracks just aren’t built for it). Still, if that day comes, the Oregon Department of Transportation’s (ODOT) new 13-car Talgo 8 trains — the world’s first — are built to handle the maneuvering and speed. Faster wi-fi to access the Internet. A bistro car for meals. A car dedicated to storing bicycles, including cargo bikes. Under federal funding guidelines, Washington was already required to add two additional roundtrips between Portland and Seattle by 2017. Because the Washington Department of Transportation owns three of the five existing Cascades trains and Amtrak owns the other two, that mandated expansion could have eliminated much of the service between Portland and Eugene. Source: “Oregon’s new Amtrak Cascades Talgo 8 passenger trains roll into Portland,” by Joseph Rose, October 18, 2013. The Oregonian. Our modern light-rail and streetcar system is a continuation of a long history of using “rails” for mass transit in the Portland metro area. The entire Willamette Valley had a long history of using rail systems for transportation. It was interrupted by 36 years of “bus only” public transportation from 1950 until the Eastside Max Blue Line (light-rail) opened in 1986.In 1872, just 21 years after Portland was officially founded, the city’s growth prompts the need for a public transportation system. Portland’s first trolleys, brought by steamer from San Francisco by Ben Holladay, were horse and mule drawn, operating on First Avenue from Glisan to Caruthers. In 1888, steam-operated streetcar lines began service, developing into a network that served Hawthorne, Mt. Scott, Mt. Tabor, St. Johns, west Portland, and Vancouver, Washington.By 1889, electric streetcars began service, gradually replacing horse-drawn, cable and steam-powered lines. Installed by land developers to promote new subdivisions, a network eventually extended out to city limits in all directions. By 1910, interurban railway service extended from Vancouver south to Eugene and Corvallis, and from Gresham and Troutdale west to Forest Grove and McMinnville. Meanwhile, the “Good Roads” movement gained momentum, and Oregon embraced the automobile—becoming the first state to pay for roads with a gas tax.In the 1920s, trolley transportation growth slowed. Cutbacks in service and labor economies, such as remodeling equipment for one-man car operation, became the norm. The Great Depression saw further erosion of what was once one of the most advance rail systems in the West. Buses and trolley coaches began to replace electric streetcars. Several interurban rail lines discontinued passenger service as ridership declines and the aging streetcar system began converting to buses and trolleybuses. WWII saw a resurgence of the use of the rail system due to gas rationing and limited availability of cars. But it was short lived and by 1950, the last streetcars were retired. Automobiles became the main source of transportation and leaders had to deal with a new problem: congestion on the roads. American Company to Start Building Streetcars Clackamas-based Oregon Iron Works, was selected by Portland Streetcar Inc. for a $20 million contract to build seven new streetcars at about $3.3 million apiece. The company produced the streetcar, making it the only company in the U.S. building the “modern American streetcar.” The push for urban transit systems could prove to be a boon for Oregon Iron Works, but many cities are holding off on their plans to build streetcar lines so the future is bleak. The Portland metropolitan area has an extensive bus lines with over 650 buses. Here are the links to the fleets to include photos of some of TriMet’s buses and a link to the bus routes maps and schedules. Zipcar is a car-sharing system where you share access to hundreds of Zipcar vehicles. You reserve a car online or by phone; you drive – to a meeting, to run errands, or to hit the lumber yard; and you return to the car’s designated parking space, all for one hourly rate that covers gas and insurance. All you pay for is the drive. The Portland Zipcar system has 240 vehicles. Also available to lower commuting costs is an extensive bicycle path system. Plus TriMet is now 100% bicycle friendly! All MAX and buses can accommodate bicycles. Check out the bike links.The average daily trips across Portland’s four busiest cycling bridges have increased after a one-year decline according to a report released in November 2010. There are now roughly 17,500 bicyclists per day crossing the Willamette River via four bike-friendly bridges the − Hawthorne, Steel, Burnside and Broadway − according to the study. Bike traffic on the four bridges increased 12 percent. Cyclists represented about 14 percent of all vehicles crossing those bridges, a one percent increase compared to 2009. On the Hawthorne, 20 percent of all vehicles crossing were bikes, a one percent decrease compared to 2009. On the Broadway the number of bikers was 16 percent; on the Steel, 17 percent; and on the Burnside, 5 percent. The City of Portland has extensive bike maps and resources at their website. You can also use byCycle bicycle trip planner, a free online tool to help both new and seasoned cyclists plan safe trips through the city. This private website was created by cycling enthusiasts volunteering their time, with support from Metro. Renting a bike for a short trip are widely used in Europe but are new to North America. Paris supports one of the world’s largest systems, with 21,000 bikes, 170,000 annual subscribers and kiosks throughout the city. Cities across the nation, including Portland, are investigating whether they would work on their streets. Finding the money is the problem. Washington, D.C., already has a small program − about 100 bikes − the first in the United States. The programs typically are expensive, averaging $3,400 to $4,000 per bike when figuring in the cost of docking stations, tracking and payment technology and installation. Portland Bicycle Tours, a 3-year-old rental business, began offering subscriptions in 2008. They have 40 recycled bikes locked in high-traffic areas and at a garage in Old Town/Chinatown. They charged members $20 to $40 per month. When members need a bike, the system sends them the lock combinations by text message.For information about bike sharing in Portland, visit the City of Portland’s Office of Transportation. Fresh from the Kona Productions Crew, How Bikes Make Cities Cool — Portland, is a five-minute mini documentary that explores the thriving bicycle culture resident to one of North America’s most progressive metropolises. Filmed entirely by bike, with support from longtime Kona Portland dealer Sellwood Cycles and resident Team Kona athletes Erik Tonkin and Matthew Slaven.